About a half hour in to Sunday night’s 2013 Academy of Country Music Awards presentation, Eric Church took the stage to perform an acoustic version of his latest single “Like Jesus Does.” Church, who is usually known for his baseball cap, aviator sunglasses, and rowdy country gone rock sound, kept it simple this time, accompanied only by his guitar and one harmony singer–a breathtaking female in a red dress, adorned with a crown of dreadlocks. As much as Eric Church’s performance caught the ACM crowd and Eric’s fans by surprise, so did this virtually unknown singer accompanying him. Immediately country fans took to Twitter and Facebook to try and discover the identity of this mystery girl in the red dress. Eric Church’s duet partner was none other than Memphis, Tennessee native Valerie June. A self-proclaimed proprietor of “organic moonshine roots music,” she is an authentic of a roots singer as you will find. Born in Jackson, Tennessee and raised around Gospel music, her father was a music promoter who worked with gospel musicians and even Prince. When she was 19, Valerie moved to Memphis and began collaborating with a band called the Broken String Collective. Similar to Valerie’s unannounced, and unexpected appearance on the ACM Awards, almost like an apparition she has appeared and performed in many places and collaborated with many names, earning instant respect from the power of her voice and her authentic style. She performed at the 2012 Muddy Roots Festival where she notoriously hushed a rowdy crowd. Saving Country Music saw her perform just 3 weeks ago as part of The Revival Tour’s South by Southwest Showcase. Valerie June didn’t announce her performance on the ACM’s. Her name was not mentioned in the credits or by the announcers. But like she always does, she left an indelible, unforgettable impact on the hearts and ears of the ACM attendees and viewers. 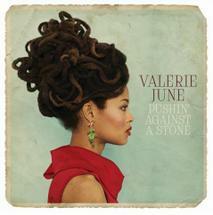 To say Valerie June is an artist to watch is a gross understatement. The ACM Awards may have been the first opportunity for many people to catch a glimpse of Valerie June, but it won’t be the last they will hear from this singular songstress. That is great! I am a big fan of hers. Glad to see her get some big time exposure like this! Thanks for the confirmation. I was fairly certain it was her but nice to know for sure. How did you confirm? Commenter Pixie Dixie posted a link to an Associated Press photo of her backstage, attributing it to Valerie June. That’s a source I knew I could trust. It’s so weird. No info from her on her social media, no press releases, no mention of her on the broadcast or on any other outlet. That is why I stayed up till 3 AM to post this last night. I wanted to make sure if folks were wondering who she was, they could find that info and connect with her music. Like Caitlin Rose a couple of years back, it looks like all of Valerie June’s publicity is centered around the UK. I thought for sure that’s who it was. 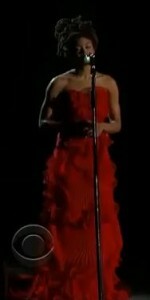 Alot of people have noticed her from last night from what I’m hearing on the Radio. Of course on the Big D and Bubba radio show they didn’t like her style. I saw a ton of interest in her last night when I was searching around, trying to confirm if it was indeed Valerie, and this morning there’s been lots of people taking to search engines to try and find her name. Can’t imagine this will be nothing but a big boost for her. If anyone has info on how this duet came about, I’d love to hear it. Also, I sure wish he would have given her some recognition. I wonder if he even knew her music. Even so, it would have been considerate of him. I’m going to try and get more of the story. Just saw her 3 weeks ago backstage at the Revival Tour showcases at SXSW. I agree it is unfortunate that they couldn’t have at least mentioned her name, but this is pretty par for the course in instances like this. It’s all about the big stars. Nonetheless, it was a pretty intimate performance on a massive platform. I’m blown away they didn’t give the opportunity to a bigger name, but it was a huge blessing for Valerie. That’s why I stayed up till 3 AM writing this to do what I can to get her name out there. This article is getting buzzed pretty hard, so hopefully people match up the name with the performance. And thanks for the link to the AP photo. That was the confirmation I needed. What caught my attention besides them not mentioning her name, was the fact that at one point in the performance, around the 2:25 mark Eric turns and smiles during her singing. It seemed as if he really enjoyed her voice and to me that was his recognition to her, which I liked. Showed some respect in my opinion. He does turn around and point to her at the end and who knows may he did say her name or something but his mike was cut off by then. It’s just nice to see Eric do something like this after his duet with Douche 1 and Douche 2 (Bryan and Aldean). Folks who read this site know I’m not much of a fan of Eric Church the person, and I’m not really a fan of this “Like Jesus Does” song. But I give the man huge props for getting up there with just an acoustic guitar and singing from the heart, and shedding the aviator glasses and ball cap branding to deliver what might have been the most inspired performance of the night. Then he acknowledges Valerie at 2:25, and as Big Stem points out, seems to acknowledge her even more, and maybe tried to say her name at the end. I think the acknowledgements Eric gave her might go even farther than saying her name in the long run, because they were so sincere. You could tell he was impressed, and how could you help but not be. Good on Eric, and good on Valerie. I am really really glad this happened last night. These are the moments that remind us why we love music so much. I would love to see a future collaboration with Valerie June that might include; Robert Randolph; Carolina Chocolate Drops, or Allison Krauss. I am a huge fan of Eric Church and have been since the beginning of his career. Let’s face it, that thing with Aldean was a favor for letting him tour with him and giving him a platform. Anyone would have done the same that’s a stand up guy. Musically speaking this guy is the best at the moment in an industry steered by guys licking the penny loafers of the execs. He does what he wants with his music. I have read on this blog that he is an arrogant prick personally. I tend to think that he would come off that way if you crossed him wrong given his past with people being pricks to him. As far as his performance last night with Valerie June, it was probably the best of the night and most creative. He knows his music and he knows talent. Last year they asked him who he would most like to sing with given the opportunity and he answered Kasey Musgraves before she had released her hit. Like Jesus Does is far from my favorite Eric Church song, but this was easily my favorite performance of the night. If you’ve seen the new video for the live recording of Over When It’s Over, you’ll see that he acknowledges his backup singer enthusiastically during that song too (Joanna Cotton). Memphis loves VJ and crunk roots. I actually recently took a listen to the album version of this song, and it’s a damned good song on there too. I’m starting to get a little bit more impressed by him in general. This was one of the best and my favorite ACMs performance. Blew away the mediocrity there. i generally dislike the americana label and most of the artists in that genre but i have to admit that without it people like valerie june and the chocolate drops would probably starve to death and that would be a crime. her voice is magic the way iris dements voice is magic and thats saying a lot.